A robust, American bison dominates the design of the Buffalo Water Beer Company’s signature beer, Bison Blonde. You might be familiar with the image, as it was the centerpiece of $10 issued between 1901 and 1925. The famous bison “buffalo bill” was one of few animals to upstage presidents and statesmen on the front of U.S. legal tender. Yet, the history behind this burly buffalo is still under debate, with two popular stories surfacing. Both stories agree that the 1901 $10 legal tender note pays homage to the U.S. government’s dedication to the frontier. In 1804, president Thomas Jefferson had hired his private secretary Meriwether Lewis, seen to the left of the bison, to explore the Pacific coast. In turn, Lewis requested the services of his military colleague and doctor, William Clark, pictured to the right of the bison, to help lead 33 men across the American plains in a journey that would span 863 days and over 4,000 miles. No doubt, the bison note was issued to commemorate the expedition of two great American explorers, as well as garner interest in the upcoming Lewis and Clark centennial exposition in Portland, Oregon in 1905. Bureau of Engraving and Printing picture engraver G. F. C. Smillie engraved the portraits of Meriwether Lewis and William Clark. The Front Side of the famous 1901 Buffalo Bill featuring explorer. Meriwether Lewis (left) and William Clark (right). So, where does the bos bison fit in? Come the turn of the 20th century the American bison’s numbers had plummeted from 70 million to 1,091 according to the Wildlife Conservation Society. At this point, the first farms were set up to prevent the extinction of the animal, with rancher Michael Pablo purchasing 13 bisons from a Native American. Some sources say the bison that would be featured on the note arrived at Washington Zoo on October 23, 1897, purchased from Michael Pablo for $500. Hence, many have called the animal the “Pablo Buffalo” to honor the rancher’s commitment to preserving a great American icon. In 1902, one year after the buffalo bill was first issued, the federal government started a restoration project in Yellowstone National Park and discontinued the hunting of buffalo. It appears coincidental that Pablo’s heroics coincide with Lewis and Clark’s anniversary. While many numismatists agree the note was issued to commemorate Lewis and Clark’s centennial celebrations, many also believe the animal pictured did not roam the open plains. The second buffalo story explains how the portrait is of Black Diamond of the Bronx Zoo, New York City, a 1500-pound animal reject from the Barnum and Bailey Circus. Either way, the bison image (Miscellaneous Die # 5390) was based on a drawing by accomplished wildlife artist Charles R. Knight and was engraved by bureau engraver Marcus W. Baldwin. Whichever story is true, the buffalo was no doubt chosen as a symbol of adventure, hard work and success. And on April 10, 1901 the New York Times called it "as artistic as any [bill] that has been issued in many years." With many collectors paying up to $5,000 for a buffalo bill today, one can see why. And while many enthusiasts, including CNN owner Ted Turner, would love to see the U.S. Treasury reissue the century old $10 note, there may be some ergonomic issues preventing this from becoming a reality. While the buffalo bill measures seven inches by three inches, today’s smaller wallets are only equipped for 6 1/8-by 2 3/5-inch tender which was adopted in 1928, three years after the buffalo bill design was discontinued. 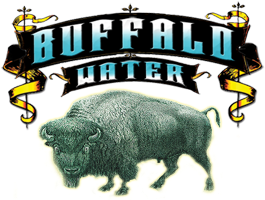 However, there is one place you can find the great American bison, and that place is on a bottle of Buffalo Water beer.